So is there actually evidence that search engines are picking up on real time social marketing postings? There is now -- and I have concrete iron-clad proof! 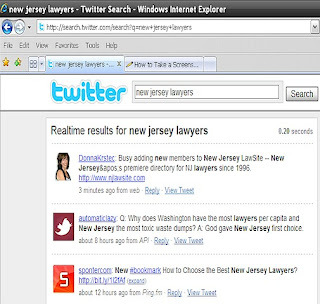 I then immediately went to Twitter Search and searched for keywords 'new jersey lawyers'. What were the results? See the screen capture below. Again, my Twitter post is at the top of the page. Can it possibly get any better? You betcha. 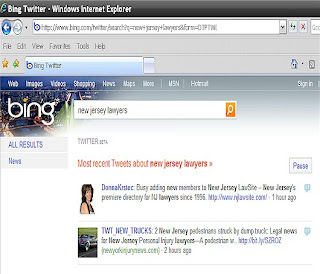 The Bing/Twitter Search also has a link at the top left reading "ALL RESULTS". Hit that and it takes you to Bing's regular search results and guess what? New Jersey LawSite has a top ten position there. Double the bang for my buck? No -- double the bang for my no-bucks -- sweet! So did Google miss the boat on this one? Let's not underestimate the reigning King of Search Engines. Mere hours after Microsoft made its Bing announcement, Google annouced that it too will include Twittter updates in its own search results. Read Google VP of Search Products and User Experience, Marissa Mayer's company blog post. Ouch Microsoft -- should have made that agreement exclusive. So what does this mean for you and me? Absolutely nothing. Should you optimize only for Google? Only for Bing? No way. Yes, you heard right. As long as you have organic positions at both of these search engines (which you do if you are an AJIS.com client) and are actively posting to your social media accounts, you will continue to ride the crest of good SEO. I hope that this blog convinces you all of the important role that not only SEO plays in your success, but the role of Social Media integrated into your SEO. Please read our past blogs on SEO Basics and Social Media participation to boost SEO efforts. Not an AJIS.com client yet? Contact us with any questions or comments. We've been sending New Jersey lawyers to the TOP since 1996 and would love to bring you on board.